DAT2TM Diamond Activation Technology a combination of Diamond BlendTM and Activation Technology ensures condition and colour integrity are maintained. Improved formula to suit the Australasian hairdressing market. Affinage Infiniti Satin Tone on Tone assists in rebuilding and repairing whilst colouring. 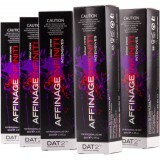 Affinage Infiniti Satin Tone on Tone has a new improved fragrance, increased colour deposit with high quality pigments. NO ammonia content, Simplified technical training, including removal of the 50% grey rule. Inspired by life, Affinage has developed a colour palette full of love. Please choose your colour: INFINITI SATIN - 100ml DAT2™ Diamond..